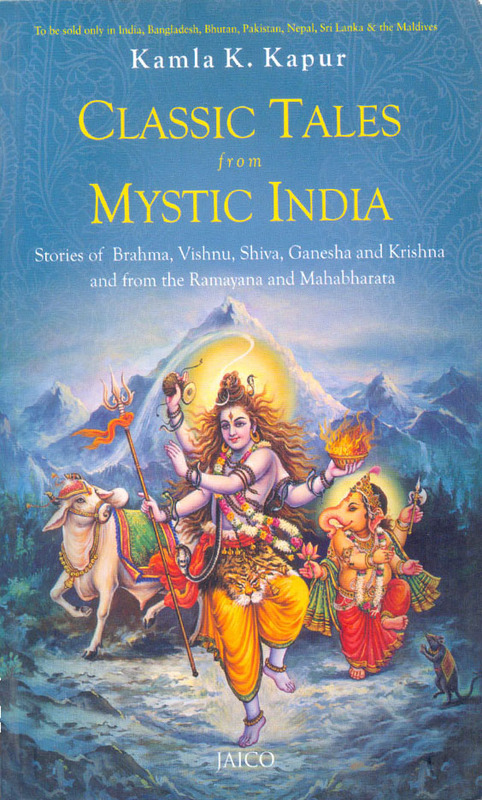 Classic Tales from Mystic India is a collection of some of India’s most insightful and philosophical tales and myths from the Hindu Tradition. Some are celebrated, others are small gems not readily known to Western readers. The short stories encapsulate some of life’s essential truths. The gods of India in their abodes, humans struggling with life’s problems, and gods and humans interacting, all reveal their lessons. Adaptations from the Mahabharata, Ramayana, Puranas, and Vedas illustrate the great spiritual and practical themes of the human condition. The author has recreated, embellished, and dramatized these tales to reveal their relevance to modern times. Shiva and Parvati’s wedding reveal a love that includes but transcends the battle of the sexes. Vishnu’s incarnation as a boar demonstrates the strength of the bonds of attachment that even gods are not immune from. Brahma’s entrapment in the web of Maya leads him to learn to free himself with his mind. Krishna’s compassion for a little bird ensures that creation continues even within the destruction of war. Markandeya’s fall out of Vishnu’s mouth, and into the ocean of chaos humbles him in the face of the mystery of life. These are a few of the immensely readable and instructive tales included in the collection. The armies of both sides, the Pandavas, and the Kurus, were mobilized and ready. Horses snorted and neighed, elephants trumpeted, conch shells resounded in the air, war drums rolled. The Mahabharat, The Great War between good and evil was about to begin. ..Krishna, sitting alongside Arjuna in his glorious chariot drawn by white horses, drew an arrow from his quiver, strung it on his mighty bow, and was about to let it fly as a signal that the war had begun, when Chidia, a little bird, flew into his line of vision, and perched herself on the yoke of the horses. Looking as aggressive and intimidating as she could, her feathers fluffed up in anger, she looked at Krishna and Arjuna, and said: ‘I will not let this war proceed.’..The young soldiers standing by, eager, ready, and chafing at the bit for battle, laughed in disbelief and derision. Krishna and Arjuna, momentarily distracted from the tremendous task ahead of them, looked at each other, and smiled. ..’Oh” said Arjuna. ‘Are you, like me, afraid of bloodshed, little bird’ Then let me tell you what wisdom I have just learned from Lord Krishna here ‘..’You are the great Lord of the Universe” said Chidia, turning to Krishna. ‘Then you are just the person I wanted to see. My nest is over there on the ground in the fecund, worm-filled grasses beneath that flowering Gulmohar tree. My five fledglings hatched a few days ago. I cannot have elephants and horses, chariots and crazed men trampling the fields. You must stop this war immediately. ‘ ..The soldiers guffawed and came over to shoo the stupid little bird away, but Krishna held up his hand and stopped the soldiers. ..’What kind of a lord are you’ Encouraging grown and conscious men to kill each other’ Destroying the nests of helpless little birds like me’ Annihilating seeds even as they sprout in the earth’ Allowing blood to splatter on blossoms, and letting this horrible tumult overpower bird song” ..Krishna was thoughtful and silent. Arjuna compassionately continued his dialogue with the bird. It was important to him that the wisdom he had just acquired from Krishna be communicated to even the tiniest creatures of the earth. ..’I too, was distraught and despairing at the thought of killing my fathers’ and mothers’ and wives’ brothers. O day of darkness, I cried. What evil spirit moved our minds for the sake of an earthly kingdom to kill our own people”..’Exactly,’ said Chidia. ‘War is a terrible thing. Let no wisdom from this lord here or anyone else allay that despair.’..’Nothing can,’ Arjuna said, sadly…’Good,’ she said, turning to Krishna. ‘So let’s stop this madness right now and the soldiers of both sides return to their peaceful, comfortable nests, delight in children, eat bread made from the grains in their fields, adorn themselves with spring flowers, and make sweet music.’ ..’But neither should we be deterred from the righteous act by fear or cowardice,’ Arjuna countered. ‘This is a necessary and important war, and it cannot be put off. Good must fight evil whenever it rears its ugly head.’ ..’I know nothing of righteous acts or good and evil. I know only that my fledglings have just hatched and that my Chida and I were very happy till this chaos began. Krishna, say something. Do you hear me’ Are you deaf’ Please, please take your important and righteous war somewhere else, for I won’t let you make it here.’ ..’Little bird, everything that is born must die,’ Arjuna said. ‘But the spirit is beyond destruction. You, I, your fledglings, my children and brothers and relatives and enemies have all been for all time. Never was there a time when we weren’t, and never will there be a time when we won’t be. In the scale of the universe, blood and blossoms, singing and dying, are one. So face what must be, and cease from sorrow.’ ..’Oh,’ cried. Chidia, looking at Krishna, and pleading. ‘Let not the thread of my song, and the song of my children be cut while we sing. Let not my work end before its fulfillment. Let not my happiness be nipped in the bud!’..’We may only accept the ways of the world, little bird,’ Arjuna said. ’But these are the ways of foolish and ignorant men!’ argued Chidia. ..’The ways of men, too, are the ways of the world. That which cannot be changed, that which is, is destiny. And destiny is His will. We can only submit humbly, little being. We can only eat the given.’..There was a long silence, a wide calm before the storm. Nothing moved, nothing stirred. Chidia suddenly and quietly felt very small. She understood that she was just a little, tiny, helpless creature who couldn’t change the course of history, or the big wide world in which she lived and bred and sang. Her only recourse was to accept the inevitable war. She lowered her head humbly, and bowed to Krishna. ..’I will eat what you give me, if that is the only thing I can do,’ she said quietly, resignedly. But then emotion welled up in her to overcome her wisdom, and she cried, ‘but, Krishna, Krishna make it sweet, do you hear’ And you who hold the universe in your mouth, you who accomplish your purposes through death and destruction, you from whose flute all birds have learnt their song, protect me and mine from this madness, Govinda!’ “Having said what she came to say, Chidia turned around and flew away.” The young soldiers were glad to see the end of her. Now the action could begin. Arjuna sounded loud his war cry like the roar of the lion, and blew his far-sounding conch shell. Then war drums rumbled, cymbals clashed, trumpets blew and filled the sky with a thunder so fearful that heaven and earth, and the hearts of all the soldiers trembled…Krishna took up his bow again, strung an arrow, and took aim. With a loud twang he let the feathered arrow fly towards the enemy camp. It seemed to the surprised soldiers that he had faltered and missed the mark. Instead of hitting the enemy’s general, or even the elephant on which he sat, the arrow merely severed the huge and heavy brass bell around the elephant’s neck. It fell to the ground with a mighty clang. The war began. And a terrible war it was, sad to see. Eighteen long days the battle raged. When it was all over, corpses littered the field, and the earth was soaked with blood. The nests on the trees were knocked to the ground with lances and spears. The nests on the ground were trampled underfoot by soldiers, horses, elephants, and chariots…Krishna, with Arjuna by his side, alighted from his chariot and walked slowly to the Gulmohar tree. He bent his knees and with both hands, lifted the brass bell where it lay on the grasses. Beneath it Arjuna saw something stirring in the still fields, and then with a whirring, whirling sound of wings flapping, five fledglings and their parents flew, singing, into the blue beyond. We asked Kamla a few questions about her adaptations, as well as the marketing of the book…. …India’s gift to humankind is not just its emergent information and pharmaceutical technology but something more valuable [found in the book]…. …a unique distinction of using a magical way of looking at life…immensely readable.